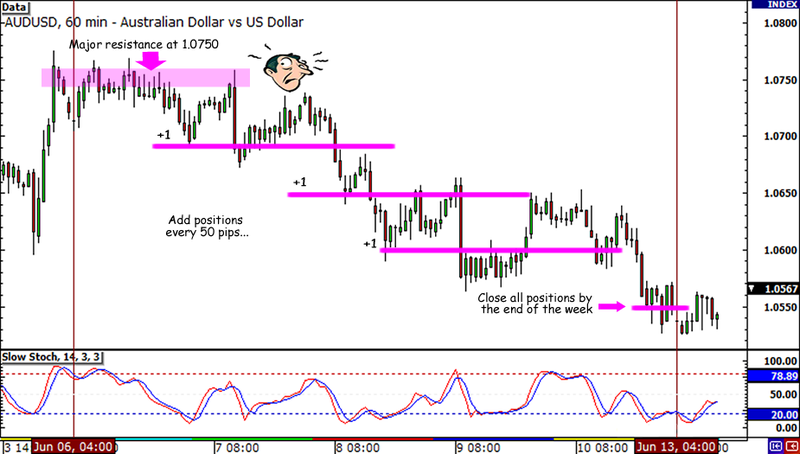 Comdoll Weekly Replay (June 6 – June 10, 2011): 300-pip Setup on AUD/USD! Happy morning guys! As much as it makes me cringe to admit it, AUD/USD showed the most profitable trade setup last week. Too bad I was on the other side of the trade! If only I wasn’t too busy showing my friends around the neighborhood early last week, I probably would’ve spotted AUD/USD‘s strong resistance at 1.0750. Heck, I could’ve even gotten in at a retest of the level just before it sharply fell down! Looking at the 1-hour chart, I can see that the best strategy for this swing trade would’ve been placing a tight 20-pip stop at the beginning, and then adding to my position for every 50-pip drop using a 70-pip trailing stop. That’s a total of 4 positions! If I had manually closed all of my imaginary positions at 1.0550 near the end of the week, I would’ve gotten a cool 300 pips and a 4:1 reward-to-risk trade ratio. Goodness, an additional 4% in one week?! Gah! Too bad I’m on the other side of the trade! Remember my AUD/USD long trade at 1.0600? And I thought that my horizontal levels would actually work this time. *sniff* Oh well, at least I learned another lesson! Next time I should also pay attention to the bigger picture, and learn NOT TO FIGHT A TREND. Did anybody else learn a thing or two from the past week? I hear some of my friends on Twitter and Facebook also took some hits. There was even someone who lost as much as 80 pips! Don’t worry though, it’s the start of another week! Let’s go bag ’em pips, shall we? Hey, everyone! What’s up? I just came back from a weekend trip to Six Flags with my cousins, but it looks like we weren’t the only ones who went on a wild roller coaster ride. The Aussie, Loonie, and Kiwi had their own twists and turns last week, too! All three started the week on a strong note as USD/CAD dipped to .9750, NZD/USD made another new yearly high, and AUD/USD held on to the 1.0750 area. However, the Aussie took an early dive and plummeted for the rest of the week. This was probably because many were counting on a rate hike from the RBA but they disappointed by keeping rates on hold at 4.75%. The RBNZ followed suit and decided to keep their benchmark rate at its current level as well. At that time, risk aversion started to take over and give the comdolls another downward push. By Thursday, demand for the Aussie grew even weaker when Australia released a weaker than expected jobs figure. Net hiring was up by only 7,800 in May, which was much less than the estimated 25,600 increase in jobs. Even worse, the April employment change figure was revised to show an even larger decrease in hiring. Honestly, I’m not used to seeing weak figures like these from the Land Down Under! I guess I expected too much from Australia when I took that long AUD/USD trade last week. To think I got giddy over that inverse head and shoulders pattern that seemed to form on the 1-hour chart. So much for that. Not even the “strong vigilance” phrase in ECB President Trichet‘s speech was able to cheer the markets up that day. Then, when we started seeing all red numbers on the economic calendar on Friday, it was just too much for the higher-yielding comdolls to bear. NZD/USD fell back below .8250, USD/CAD ended near its week open price, while AUD/USD sank to 1.0550. Anyway, enough of the gloom and doom. I decided to keep my spirits up and also spice things up for y’all with something I came up with over the weekend. And no, it’s not a new recipe for butter pecan pie! Look guys, I finally found a way to thank my friends on Twitter and Facebook! After some thought, I decided that I’ll be featuring different newbie/expert traders on my weekly comdoll replays. Consider this as my way of thanking my Twitter and Facebook friends for sharing with me their trading thoughts throughout the week. For this week, let’s give snaps to @EnkhbatOne! @EnkhbatOne is a newbie trader who loves to trade the NY and London sessions. He also tinkers around with Fibs, Elliott Waves, Mirror Image Patterns, and Gann’s Techniques. Apparently, he lost his first account by taking profits too early and letting his losses run. His advice to his fellow newbies? Start trading live accounts with small amounts of money, as it can help your mental challenge with trading real money. Oh, and have I mentioned that he can’t trade without tweeting with other traders and drinking coffee?